Fishing Now Nam Lake in Bangkok for carp and catfish allows the visiting angler the chance to fish for various monster fish species found in Thailand. The fishery is situated a short forty five minute drive from the centre of Bangkok in an outlying district f the city.On arrival at the lake anglers will be greeted by a narrow elongated lake nestled amongst the houses of a quiet residential area. The fishery is a well stocked commercial fishery which is favoured by local anglers and allows fishing from one sheltered fishing platform which runs along the entire length of one side of the fishery.Various angling techniques can be used whilst fishing in Bangkok which include float fishing, method fishing and predator fishing with small ornamental live baits for the many Featherback species. Carp fishing methods at this venue incorporate method feeders loaded with locally produced groundbait and fished with popped up hooks. In addition to carp fishing at this venue anglers can also use conventional Mekong Catfish fishing methods and fish with sliding float set ups at mid depth for the monster catfish. Predator fishing is also possible at this fishery for some of Thailand’s smaller predatory species with freelined ornamental livebaits and wobbled livebaits scoring well with the predators on a regular basis. Fishing in Bangkok at this lesser known venue allows the angler to fish for a wide variety of Thai carp species such as Giant Siamese Carp, Silver Carp and Big Head Carp not to mention the rarely caught Common Carp and Koi Carp.Fishing here is at slightly slower pace than a lot of other lakes in Thailand and the lake very rarely receives a great deal of angling pressure. 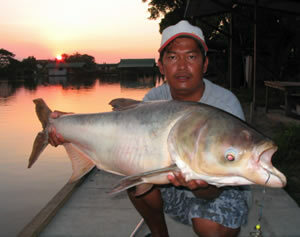 Now Nam Lake is favoured by local anglers who regularly descend on the venue at weekends when it can become crowded. We recommend visiting this venue mid week to avoid the crowds. Carp fishing at this lake can be highly productive and regularly sees anglers’ landing multiple monster fish hauls of carp and various other monster fish species when fishing over large beds of bait. Fishing for Carp and Catfish at this venue is the perfect choice for a day’s freshwater fishing for monster fish near Bangkok and is suitable for anglers of all skill levels and experience.Thailand Carp fishingA typical day fishing for carp and catfish in Bangkok generally produces mixed hauls of various carp and catfish species with anglers generally landing between five to ten monster fish each day. Carp fishing at Now Nam in Thailand is an ideal choice for carp anglers choosing a Thailand fishing holiday and offers the angler the opportunity to catch a wide variety of carp and other freshwater monster fish species. On your arrival at the lake the angler(s) will be equipped with three rods, three Shimano reels, alarms, all terminal tackle and 50kg ‘Lam’ local groundbait and all bait additives. This fishery is a mature eight acre lake and highly prolific water that produces multiple catches of various Asian carp and catfish species on a regular basis.Fishing at this venue is restricted to one bank with the out of bounds bank bordered by a residential area.Anglers fishing at the lake will encounter numerous species of Asian carp with Giant Siamese carp which have been caught to sixty kilo’s, Bighead carp, Rohu and various other cyprinids. 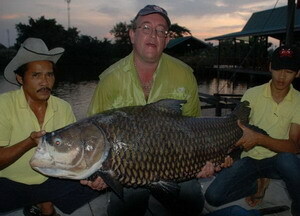 In addition Now Nam holds a large head of Mekong catfish with weights believed to be close to one hundred kilo’s. A Fishsiam guide will be in attendance throughout the entire days angling to assist with all photographic and netting requirements in addition to any other angling requirements.The duration of our trips to this venue is eight hours after which the angler(s) will be returned by air-conditioned minibus to your Bangkok hotel. Fishsiam offers daily fishing trips to Now Nam Lake in Bangkok in addition to weekly fishing holidays with various accommodation options.Fishing trips to Now Nam can also be combined in our tailor made fishing holidays designed to meet the visiting anglers specific angling requirements. Please note that due to serious problems caused by flooding we are currently unable to run fishing tours to this venue. Contact Us for information on alternative Bangkok fishing venues using the button below.